 - red footnotes indicate a heads-up for parents about the title. We cannot foresee every incident that might potentially be an issue to every family, but we have red-flagged those that are commonly a concern. For some thoughts behind the planning of this Year, some encouragement, and an explanation of AO/HEO upper years' "Salad Bar" approach, click here. Take the time to read the footnoted notes and comments; you will not be able to make good decisions about what to include or not without doing so. If this looks overwhelming for your student, you might consider plan B - a lightened load for Year 9. See it here. * Select documents from EuroDocs: Online Sources for European History. *** Optional: Amazing Grace, the movie about Wilberforce. In the 36-week schedule, Longitude or London to Land's End is scheduled in Term 1, and Journey to the Western Islands of Scotland is scheduled over Terms 2 and 3. Feel free to choose differently. For more options, additional list, most of which haven't been read by any of the Advisory, is here. Shakespeare - Continue with AO's Shakespeare rotation. 2 Hymns, 2 Bible passages of about 20 verses each and 2 entire Psalms per term. Suggestions: Psalm 23; Isaiah 40; Romans 8 (or Rom 8: 1-17); Matthew 5; James 1; 1 John 1; or choose your own. This is a good year to begin a personal quote book. A Living Science option is still in the works, but you may opt to beta test it. See our note on the progress for AO's Living Science project for Year 9. Keep flower and bird lists of species seen, select a special study for outdoor work, and continue to maintain nature notebooks. The Handbook of Nature Study Δ by Anna Botsford Comstock ($) ∫ Continue to use as in previous years. Work on drawing skills. Illustrate a scene from this week's reading. Continue AO's rotation of hymns. The Man Who Was Thursday β Δ ($ K) Ω by G.K. Chesterton. Choose one title for literature and one for free reading from these books by Sir Walter Scott ($earch). If your student has not yet read Rob Roy ($ K) Ω, we suggest that you begin with it. Many thanks to David Hicks, author of Norms and Nobility, for his kind permission to draw from his work and ideas. For more information please see the amazon.com link to the 1999 edition of his book. The Year 9 "Salad Bar"
This is a collection of some of the best resources for this time period. Even Advisory members aren't able to cover all of these with every single one of their own students and have to be selective. Feel free to pick and choose from among these suggestions. The best choice may just be the book you already own, and the one from which your student can narrate. Now for a word about books, and the design of Year 9 . . . Selecting the best books is a challenge that increases with each successive school year. High school students are journeying across the bridge into adulthood, and the books they should read at this level reflect the adult world. While previewing the content of mountains of books for the AO/HEO high school years, we've been constantly aware that we cannot predict how far across that bridge other people's children may be. Families vary greatly in their views on sheltering, protecting and preparing for adulthood, so it would be futile for us to attempt to be the censor or guardian (the bridge troll?) for all AmblesideOnline scholars. We set a very high standard for AO/HEO materials, and we've gone the extra mile and beyond to create and provide a Year 9 prototype that reflects excellence. However by no means do we claim to have done all the work for you! It remains the homeschool parent's job, most particularly on the high school level, to assume full responsibility for matching your child's sensitivities and sensibilities and your family's standards with the books you select for study. In the booklist shown here, we've offered a few notes on potential concerns in certain books, but it goes without saying that we have not noted every potential concern in every book. Please understand that the absence of a comment does not mean the absence of anything your particular family might find offensive or inappropriate. For these and other reasons, the AO/HEO high school Years are designed not as a single curriculum list (like the preceding Years), but rather as what we fondly call the HEO "Salad Bar" approach. In many subject areas, we offer a variety of options for you to choose among (or you may substitute your own). The final product will be your design. Those who still prefer the comfort of a single booklist may simply select "Option One" where options are presented. We feel that this Year 9 book list is in keeping with Charlotte Mason's principles, but it isn't the only possible way to "do" CM in high school. You are free to use it en toto, piecemeal, or simply as an example to consider. To arrive at the best high school plan for your child, expect to burn some midnight oil, dig a little more than you did to prepare for the younger grades, and make more personal choices. You should budget time over a few weeks to focus on previewing and selecting books. Look on the bright side: you'll emerge from this process more conversant and familiar with the era and books your student is about to cover -- and discussion is so vital for students in the upper grades. You'll also be more sympathetic to your hardworking young scholar! As you devise your own Year 9 curriculum, whether using our book suggestions or your own substitute titles, it's useful to keep a page count in mind. Charlotte Mason's students covered approximately 1600-2000 pages in a term by Year 9, using about 40 different books. This loose guideline will help you gauge whether your own academic load is in keeping with Miss Mason's. Before beginning these upper years, please do yourself one very smart favor: zealously pursue some teacher preparation time for yourself. It's a little investment that will pay you back double every single school day. We suggest you read (or reread) volume 6 of Charlotte Mason's six volume set. Volume 5 may also be helpful to you. Both are available online, as free e-texts. You'll also find it useful to scan the sample Programmes from Miss Mason's own PNEU school, which are linked from the AmblesideOnline homepage. Forms III and IV are the ones relevant to Year 9. 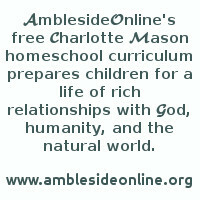 You'll find a wealth of helpful articles at AmblesideOnline, so plan to spend a few evenings exploring the site. It's also helpful to have on hand a good current book on homeschooling through high school. And you'll find terrific support on the AO Forum -- please join and participate! Resources: Study questions with maps; Bible Maps; Bible timeline. 18. The Age of Revolution is Volume 3 of Winston Churchill's 4 volume set, "A History of the English Speaking Peoples." These volumes are used across Years 7-10. Americans and those who desire a more accurate picture of the American Revolution (which is covered in Term 2) may prefer another option, or at least an additional option. One option would be to use the Churchill book alone for terms 1 and 3, and substitute an American history book to be used alone for term 2. 22. A History of the American People by Paul Johnson: An easier read than Morison (more engaging), perhaps more editorial in places. Juicier than either Churchill or Morison. Very enthusiastically pro-American. Year 9 students would read approximately pages 79-269/279. 24. A Basic History of the United States by Clarence B. Carson. Carson, a history professor, has a scholarly tone, and approaches his topic from a libertarian, probably Christian, point of view. There's a brief article with linked names here. 50. Biographies: Choose from the listed options or topics, or substitute your own. We suggest no more than 3-5 biographies over the year, depending on the length of your selections. Founding Father -- Rediscovering George Washington by Richard Brookhiser ($). Written as a moral biography after the tradition of Plutarch. Many modern biographies of Washington are plagued with revisionism, while some earlier biographies treat him with such iconic, reverent distance that he remains out of reach and never comes to life for the reader. This book avoids both flaws. 200 pages, in print. Washington: The Indispensible Man by James Thomas Flexner, winner of a Pulitzer Prize and the National Book Award. ($) A favorite among Washington biography enthusiasts, and considered by many to be the best work on his life. For an above average student, or one with a keen interest in Washington or the Revolutionary era. One note: according to one reviewer, Flexner makes the odd (and arguably insupportable) suggestion that Washington was a deist. 402 pages, in print. The Life of George Washington by David Ramsay, 1807. Δ ($) Written eight years after Washington's death, this is one of the few online biographies of GW. Approximately 368 pages. Drier and more archaic in style than other titles here. 58. Napoleon Bonaparte by John S. C. Abbott: this is a single-volume book (not to be confused with the much longer multi-volume The Life of Napoleon Bonaparte, or The History of Napoleon Bonaparte by the same author) which has portions missing in all its online texts (paperback reprints may have used the same Project Gutenberg text and be missing the same pages). Another option: The Story of Napoleon by H.E. Marshall Δ ($ K) is a possibility, although written for younger children. Foundation for Freedom: A Study of the United States Constitution Workbook by Lars Johnson - This "workbook" is the text with review exercises after each chapter, which can be skipped. ($) Foundation for Freedom is an updated, full-color version of The Story of the Constitution, Second Edition by Sol Bloom and Lars Johnson ($). Both appear to be the same book/workbook, but the newer one is in color. There is a teacher's edition/answer key available. (Sol Bloom's original 1937 Story of the Constitution, which Lars Johnson used as a foundation for his own book, is online at Hathi Trust. Because it was written in 1937, it stops at the 21st Amendment. Lars Johnson did an excellent expanding and updating the Bloom book by adding concerns that weren't on the radar in 1937. He also wrote a chapter on limited government, checks and balances, and Biblical morality as well as a full-page explanation of each Amendment; Sol Bloom's book just explains each Amendment with a sentence or two. If you are in a situation where you need an online resource, the Sol Bloom text could work, but you should also seek out a source that explains why each Amendment was added and what it does.) This book covers material that is similar to the more narrative Miracle at Philadelphia, but with a mix of both the historical background and analysis of the content. 84. Ourselves: approximately 22 pages per term. This book will continue through all the remaining years of AO/HEO curriculum. This is the 4th volume of Mason's 6 Volume Series. This year: pages 131-210 of Book 1. Also available in a modern English paraphrase that can be read online or purchased. (K) The paraphrase of Book I, Self-Knowledge, the first half of Volume 4, can be purchased as a separate paperback book. 90. Charlotte Mason had students at this level read the daily news and keep a calendar of events. We suggest students choose the most important 2 or 3 stories of the week and re-write them in their own words as a chronicle of the year, making the heading of each page something like "This Week in History, September 1st, 2003." Parents: pre-read and filter current events materials (on the web, or in print) as necessary, due to the potential for coverage and topics of an explicit nature, even from conservative sources. We've listed some possible options here. 94. The History of English Literature for Girls and Boys: $ from Kelly Kenar, who typed this e-text for the use of AO/HEO. Postage at lulu.com is automatically set to UPS ground which is expensive, but you can choose media mail which is substantially cheaper. (If you purchase this book, we request that you purchase from the link provided, as other publishers' reprints of this book have used Kelly's hand-typed etext.) This year: Chapters 60-73, on Dryden, Defoe, Swift, Addison, Steele, Pope, Johnson, Goldsmith, Burns, and Cowper. 104. Oxford book of English Verse: (Project Gutenberg has the book with a different title β $) This is a poetry anthology Charlotte Mason used; excellent (a classic! ), and online in a searchable format. Which version? * Begin with the poet Thomas D'Urfey and read through to Thomas Parnell. This is approximately 40 poems, or about 3 to 4 per week. ** Begin with Allan Ramsay and read through to the poet William Cowper. This is approximately 37 poems, or about 3 per week. *** Begin with James Beattie and read through to the poet Henry Rowe This is approximately 3 poems per week. 108. Grammar: In terms of difficulty (easiest to most challenging), Easy Grammar Plus is probably the easiest, followed by Jensen's, and then Our Mother Tongue. Jensen's Grammar goes slowly and step-by-step; their answer key is thorough (Our Mother Tongue doesn't always have answers). There are 75 lessons, so plan to take two years, or else do two lessons per week. Expect to pay about $30 for the Jensen's text and answer key. The DVD's are not necessary. You will probably find it cheaper at New Leaf Publishing, or other homeschool sellers such as Lamppost Homeschool. If you are not confident about teaching grammar, you might prefer Easy Grammar Plus by Wanda Phillips. It's less intense than Jensen's, but still doesn't assume a lot of previous knowledge from the teacher. It's easier than Jensen with just a couple suggested alterations (for example, don't insist on memorizing the prepositions at the start, just write a list of them and explain an easy way to remember most of them: any way a worm can go in relations to two apples, or a swallow in relation to two mountains). A parent using this with one child could get by with only the Teacher's Edition since the student workbook is included in it, but multiple students would need their own workbooks. ($ from their website or CBD) Easy Grammar Grade 8 Student 180 Daily Teaching Lessons by Wanda Phillips is just as good; it also has the student workbook included in the teacher's edition. 124. Apologia science materials by Dr. Jay Wile ($earch). Read the suggested course sequencing at http://www.apologia.com/store/ to determine what will work best for the needs of your student, based on interest and math level. If a student missed out on the AmblesideOnline science selections and nature study rotation, General Science should be considered as a starting point with Apologia materials; otherwise start with Physical Science. Read through Jay Wile's website, especially "course sequencing" to see what will work best for the needs of your student based on interest and math level. If financial resources are a concern, any of their science courses may easily be stretched to two years. 125. Signs and Seasons - continues this year. The book is cheaper from CBD. Field work is an integral part of this book. Field activities are included in the back of the book, so the field guide is not necessary. 150. Charlotte Mason's students were learning three languages at this level. A good English/foreign language dictionary is also recommended. 152. Physical Education: One Advisory suggestion: For routine fitness, Living Arts' Pilates videos/DVD's offer a challenging but enjoyable 30 minute mat workout that will benefit the entire family. Instructor Ana Caban gives clear and concise verbal cues that even young children can follow with a little guidance (even a 3 yob! ;-) and the background music is neither loud nor distracting. Start with the Beginning Mat Workout video/DVD ($), which explains the basics, before advancing to the Intermediate Mat Workout ($). Another suggestion: Leslie Sansone's Walking DVD's: Start! Walking ($), Walk Away the Pounds ($). 154. Nutrition: You may wish to consider books by Shonda Parker ($earch), a Christian homeschooling mother and certified herbalist. The Walls Around Us by David Owen ($) is a well-written book about how our houses are built, but it needs some previewing or parental editing.